Last July, Apple introduced its newest Mac operating system to mostly upbeat reviews. Now, after several months of real-life usage, it’s easy for me to report that “OS X Mountain Lion”––also known as version 10.8––has certainly lived up to the raves and is well worth the $20 cost of upgrading from previous versions of Apple’s OS X Mac operating system. The price is minimal yet the changes are both numerous and quite useful. 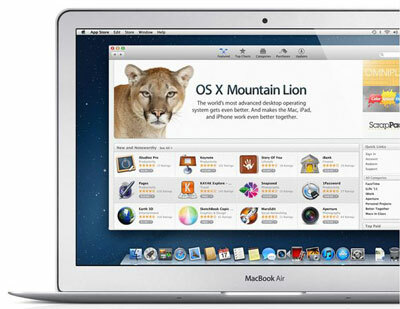 Apple asserts there are more than 200 new features in Mountain Lion. And although the average user would be hard pressed to identify most of these at a glance, some major improvements are quickly apparent because they provide an immediate productivity boost. Even Mac users who had purchased Apple’s OS X Lion (version 10.7) only one year earlier can benefit from this upgrade. But every computer operating system is a work in progress, and Mountain Lion is no exception. There is room for improvement, particularly in one of the operating system’s best and most prominent features: “iCloud” integration. It is easy to imagine, though, that the needed fine-tuning will be coming in future updates to Mountain Lion. Indeed, Apple already has released three updates. One in September (version 10.8.2) added deeply integrated access to Facebook, a feature not found in the initial release. Another recent update modified Mountain Lion slightly for better compatibility with the all-new iMac and the updated Mac Mini desktop computers. There are numerous updates that come with Mountain Lion, but make sure you check out these new features. The best new features in Mountain Lion are those that leverage iCloud, an online service that is at once an online repository for a user’s files and a virtual glue that binds OS X to iOS 6, Apple’s other major new operating system, which runs the iPhone, iPod touch and iPad. There are iCloud versions of the same Apple Calendar, Contacts, Mail, Notes and Reminders apps that are built into Mountain Lion and iOS, and all three iterations of these apps are automatically kept in sync by iCloud; an appointment added to Mountain Lion’s Calendar is automatically inserted into the iCloud and iOS Calendar apps or vice versa, for example––so there’s no excuse for losing track of what you have to do when and with whom. Documents in the Cloud pairs iWork (Apple’s alternative to Microsoft’s Office suite of productivity apps) with iCloud. All iWork documents created or modified on any Mountain Lion or iOS 6 device (Mac, iPhone, iPod touch, iPad) can be saved to iCloud, which in turn makes the latest version of the document accessible on any of those devices at any time. Documents in the Cloud allows the flexibility of grouping documents together in iCloud––by dragging one over another in a fashion similar to the way iOS apps form groups on an iPhone, iPod touch or iPad––it falls short on the ability to sort those documents and groups. Only “sort by date” and “sort by name” options are available. No “sort by type” option is offered. So the result is an on-screen mashup of individual documents and document groups, rather than an organized presentation of groups followed by individual documents, which some users may prefer. With the new Facebook integration, personal phone book information stored in Mountain Lion’s Contacts app is merged with contact information for all of a user’s Facebook friends (retrieved from the social media website), and in turn synced with the iCloud and iOS Contacts apps––creating one giant contacts list that simplifies staying in touch. A new “sharing” function simplifies sending Web addresses, photos, files and desktop items to others via e-mail or by posting to Facebook or Twitter––from within apps or from the desktop––and photos shared to Facebook can be placed directly in specific profile albums with designated privacy settings intact. Notification Center pops an alert onto the computer’s desktop when, for example, Apple’s Mail receives a new message, when the Calendar app needs to remind you about a scheduled event, or when a compatible third-party app or website sends you an alert. This includes Facebook News Feed updates and Twitter messages and mentions. And Notification Center also acts as an outbound portal, a place you can go within Mountain Lion to add posts and “tweets” to your Facebook and Twitter accounts respectively. Game Center, a social gaming network that Apple introduced with its iOS devices, is now accessible with the Mac, via Mountain Lion’s built-in Game Center app. Games are the most popular apps within the Mac App Store, and Game Center lets you keep score against your friends across Apple devices. AirPlay Mirroring makes it easy to use an HDTV as a second screen for your Mac––but only if you also have an Apple TV set-top box as the go-between. Do anything on the Mac connected wirelessly to the Apple TV and watch it happen simultaneously on the TV or your wall. AirPlay Mirroring requires an iMac, MacBook Air or Mac mini from mid-2011 or later, or a MacBook Pro from early 2011 or later, and it requires a second-generation or newer Apple TV box. Dictation lets you talk any time you’d type. It’s great for creating quick e-mail messages or using Mountain Lion’s built in Notes and Reminders apps. Gatekeeper is built-in security against malicious apps. It can be set to allow only Mac App Store apps to be installed, or only those plus apps from identified developers. Power Nap allows a sleeping notebook to still receive software updates, new e-mail messages and calendar invitations. Power Nap works only with a MacBook Air from mid-2011 or later and only those MacBook Pro computers that are equipped with a Retina display. It’s hard to argue against spending merely $20 (on apple.com) for all of the above and more. It's a good deal even for those with older Macs, which won’t be compatible with all of the new features in Mountain Lion.